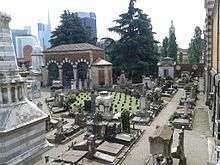 The Cimitero Monumentale [tʃimiˈtɛːro monumenˈtaːle] ("Monumental Cemetery") is one of the two largest cemeteries in Milan, Italy, the other one being the Cimitero Maggiore. It is noted for the abundance of artistic tombs and monuments. Designed by the architect Carlo Maciachini (1818–1899), it was planned to consolidate a number of small cemeteries that used to be scattered around the city into a single location. Officially opened in 1866, it has since then been filled with a wide range of contemporary and classical Italian sculptures as well as Greek temples, elaborate obelisks, and other original works such as a scaled-down version of the Trajan's Column. Many of the tombs belong to noted industrialist dynasties, and were designed by artists such as Giò Ponti, Arturo Martini, Dante Parini, Lucio Fontana, Medardo Rosso, Giacomo Manzù, Floriano Bodini, and Giò Pomodoro. The main entrance is through the large Famedio, a massive Hall of Fame-like Neo-Medieval style building made of marble and stone that contains the tombs of some of the city's and the country's most honored citizens, including that of novelist Alessandro Manzoni. The Civico Mausoleo Palanti designed by the architect Mario Palanti is a tomb built for meritorious "Milanesi", or citizens of Milan. The memorial of about 800 Milanese killed in Nazi concentration camps is located in the center and is the work of the group BBPR, formed by leading exponents of Italian rationalist architecture that included Gianluigi Banfi. The cemetery has a special section for those who do not belong to the Catholic religion and a Jewish section. Near the entrance there is a permanent exhibition of prints, photographs, and maps outlining the cemetery's historical development. It includes two battery-operated electric hearses built in the 1920s. The section, planned by Carlo Maciachini, was opened in 1872 as a substitute for the Jewish cemeteries of Porta Tenaglia, Porta Magenta and Porta Vercellina. It is located east of the catholic cemetery and has a separate entrance. The area is the result of an enlarging of 1913 which added a zone in the southern and eastern direction. The central building was originally the entrance to the cemetery. The numbering of the tombs is repeated because the cemetery is subdivided into 6 fields and an addition in the eastern side. There are also three common fields one of which for children, with burials between 1873 and 1894, with small gravestones with name, surname and date of death in the ground. The monuments, built between 1866 and our days, are located along the walkways. There are also family shrines, two of which planned by Maciachini, columbariums and ossuaries on the northern and western walls and burials in the central building. The burials are 1778, some of which are in memory of people killed by the nazis in concentration camps or in the lake Maggiore (Meina massacre). There are many monuments of artistic value built by important architects and sculptors, described in the guide book by Giovanna Ginex and Ornella Selvafolta . The following architects have worked in the Jewish section: Carlo Maciachini (shrines Davide Leonino e Pisa), Giovanni Battista Bossi (tomb Anselmo de Benedetti), Ercole Balossi Merlo (shrine Leon David Levi), Luigi Conconi (shrine Segre), Giovanni Ceruti (shrine Vitali), Carlo Meroni (tomb Taranto), Cesare Mazzocchi (shrine Giulio Foligno), Manfredo d'Urbino (shrine Jarach, tomb Mayer, tomb Besso, Monument to the Jewish Martyrs of Nazism), Gigiotti Zanini (tomb Zanini), Adolfo Valabrega (shrine Moisé Foligno), Luigi Perrone (shrine Goldfinger) and the sculptors Mario Quadrelli (shrine Pisa), Giuseppe Daniele Benzoni (tomb Ottolenghi Finzi), Luigi Vimercati (tomb Estella Jung), Agostino Caravati (tomb Alessandro Forti), Rizzardo Galli (tomb Vittorio Finzi), Enrico Cassi (tomb De Daninos), Attilio Prendoni (tomb Errera and Conforti), Eduardo Ximenes (shrine Treves), Giulio Branca (tomb Giovanni Norsa), fratelli Bonfanti (tomb Davide and Beniamino Foà), Enrico Astorri (tomb Carolina Padova e Fanny Levi Cammeo), Egidio Boninsegna (tomb Giuseppe Levi), Dario Viterbo (colombarium Levi Minzi), Giannino Castiglioni (tombs Ettore Levis and Goldfinger), Adolfo Wildt (tomb Cesare Sarfatti), Eugenio Pellini (tomb Bettino Levi), Arrigo Minerbi (tomb Renato del Mar), Roberto Terracini (tomb Nino Colombo). The central building was enriched in May 2015 with artistic windows representing the 12 Israel tribes by artist Diego Pennacchio Ardemagni. Luigi Giussani (1922–2005), priest, founder of "Communion and Liberation"
Mario Tiberini (1826–1880) and his wife Angiolina Ortolani-Tiberini (1834–1913), opera singers. The Hall of Fame of the Cimitero Monumentale is prominently featured in a climactic scene of the Luca Guadagnino's film I Am Love (2009). Alessandro Manzoni's tomb inside the Famedio. The decorated ceiling of the Famedio. Avenue of trees inside the cemetery. Representation of Last Supper, Campari family tomb. A funerary monument in the cemetery. Wikimedia Commons has media related to Cimitero Monumentale (Milan).